Access a combined audience of 1.6 million aspiring franchisees on FranchiseSales.com and BusinessesForSale.com with a profile page featuring press releases, case studies, videos and more. Together with our franchisors we provide articles, videos, podcasts and newsletters which attract visitors, educate buyers and deliver qualified leads. Your brand featured in all related content across our sites and in emails. 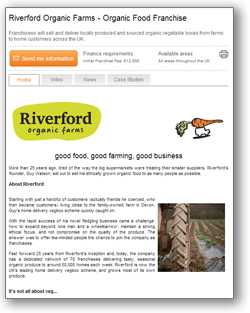 Newsletters and dedicated campaigns are targeted by sector, location and investment level. We’re the only franchise portal boasting exclusive relationships with major news and recruitment websites – promoting your franchise to a combined audience of more than 20 million potential buyers. Bring your brand to life with copy and images, plus all your news, success stories, videos, articles, resales and more. Our production team can design and create the perfect profile page for you, including a tailored enquiry form qualifying buyers to your exact requirements. If you want to expand your franchise into new territories we have got the sites and the buyers to help you achieve this. Competitive pricing – packages start from $139 per month. Established in 2001, FranchiseSales.com works with franchisors all over the world to connect them with franchise buyers. The site is part of the Dynamis Online Media Group, publishers of BusinessesForSale.com, PropertySales.com and BusinessWings.co.uk. We work with a number of partners, including the Financial Times, and together we are responsible for over $1billion worth of business, franchise and property sales every year through our classified technology platforms. Using the perfect blend of information and promotion we aim to educate buyers and ensure you attract the qualified leads you need to help your business grow. Find out more about the team and what we can do to help you in our short video. Which countries are you looking to advertise in?